Given recent upgrades in my printing capabilties, I decided to treat myself to a new monitor as well. 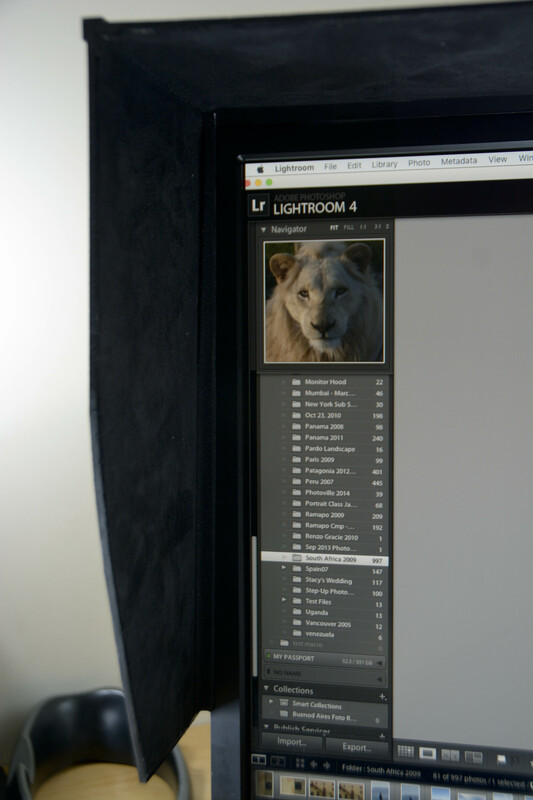 After some research, I selected a Dell U2413, a sub-$500, backlit IPS with wide-gamut coverage (99% Adobe RGB, 100% sRGB). With good reviews on TFT Central and elsewhere, it’s probably one of the best options for amateur photographers who can’t justify spending $2,200 on an Eizo ColorEdge . While purportedly marketing their flagship monitor to prosumer photographers, Dell unfortunately didn’t see fit to manufacture a hood for it. I wanted a monitor hood to block the light coming in from my large windows (and more honestly, because pimping my monitor adds a little photog street cred). Options on eBay were either expensive or cheaply made. So, I decided to go the DIY route and build my own inspired by Roger Sacul’s, post on DIY Photography. I took his concept a few steps closer to professional hoods I’ve seen. 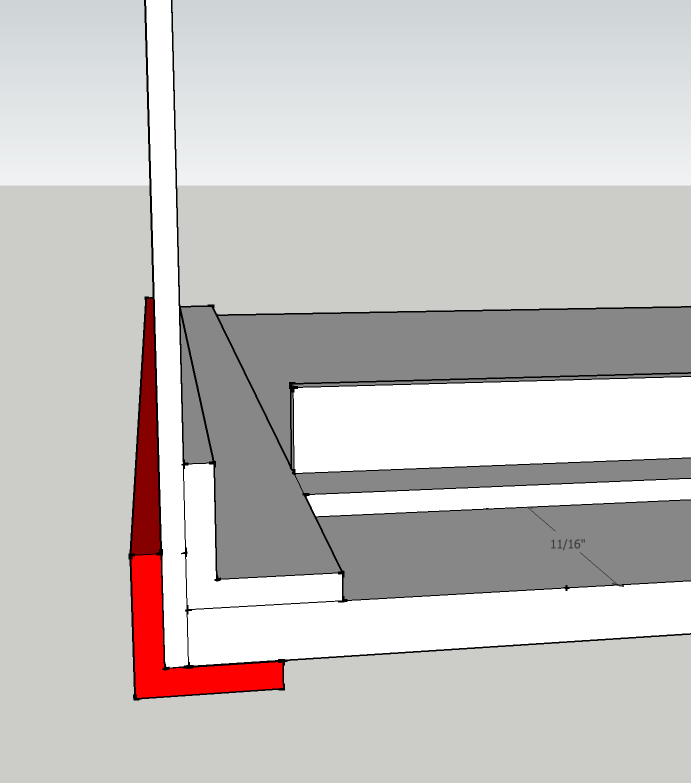 First, my design eliminates any gaps that would be noticeable if a light source were behind your monitor by extending the supports the width and length of the monitors’s top and sides. Secondly, I incorporate microsuede to eliminate any reflections off the smooth surface of the plastic. The end result looks a lot closer to the real deal (for a lot less money). While his post contains a basic framework and some nicely taken photos of the end product, it’s a bit short on the details one would normally find on an Instructable. 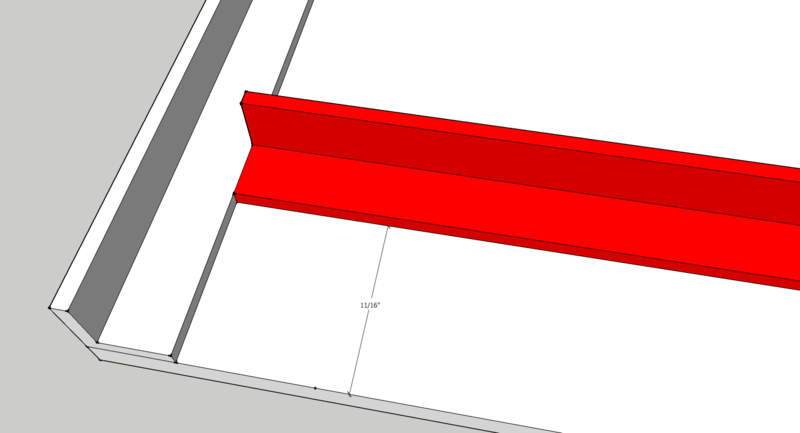 While I’m not as good a photographer, I do have some skill with Google SketchUp. So, hopefully, this post fills some of those gaps (pun intended). The second shortcoming of Roger’s post was a lack of comprehensive measurements. Those that were present had some weird “cm” notation that my ruler didn’t have on it. Here in ‘Merica we use the Imperial units of measure just like the Queen intended! 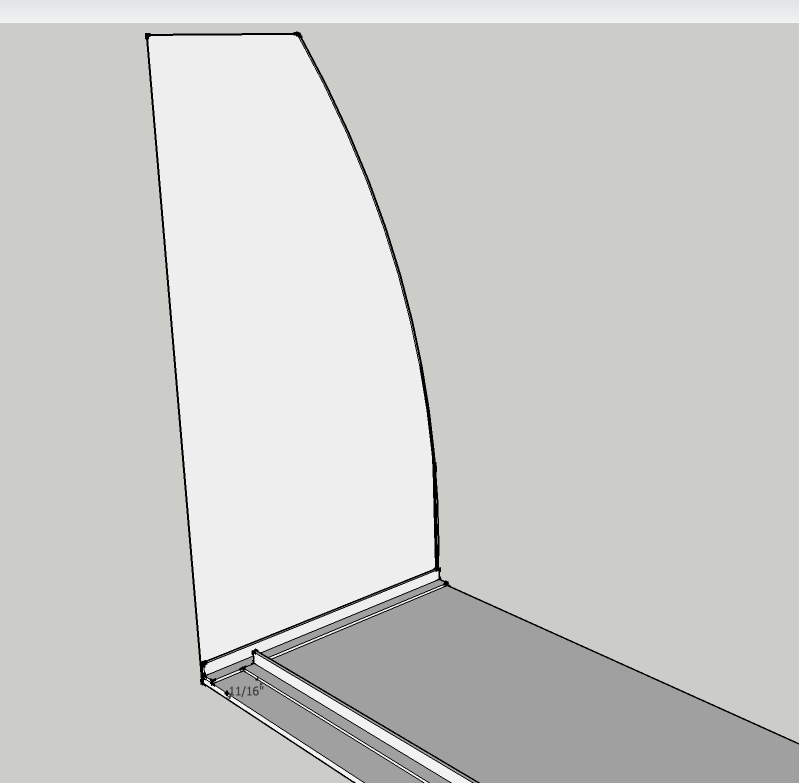 You could use these instructions to construct a hood for another brand or size monitor. You can adjust the top and side dimensions accordingly. 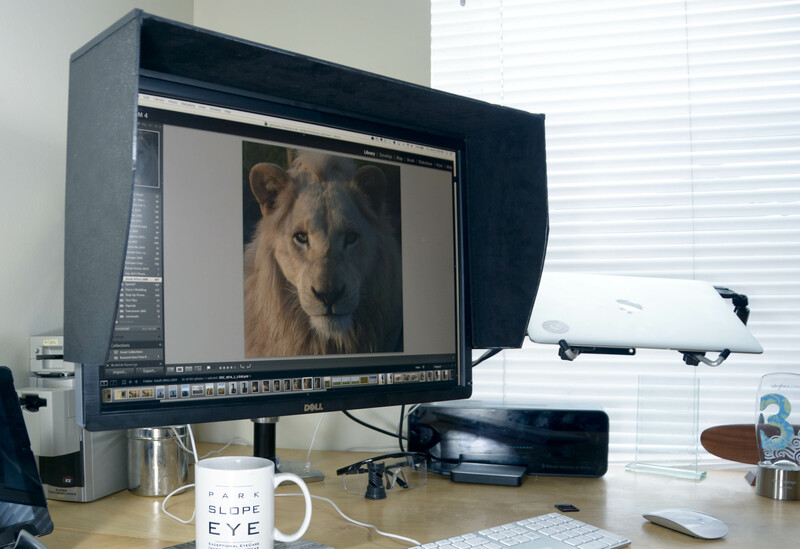 You’ll obviously need a larger ABS sheet for monitors wider than 24″. The ABS sheet has a textured and smooth end. All cuts should be made smooth side up. This will serve as the interior face of the hood. Don’t worry about stray marks since we’ll eventually cover things up with paint and the adhesive suede. 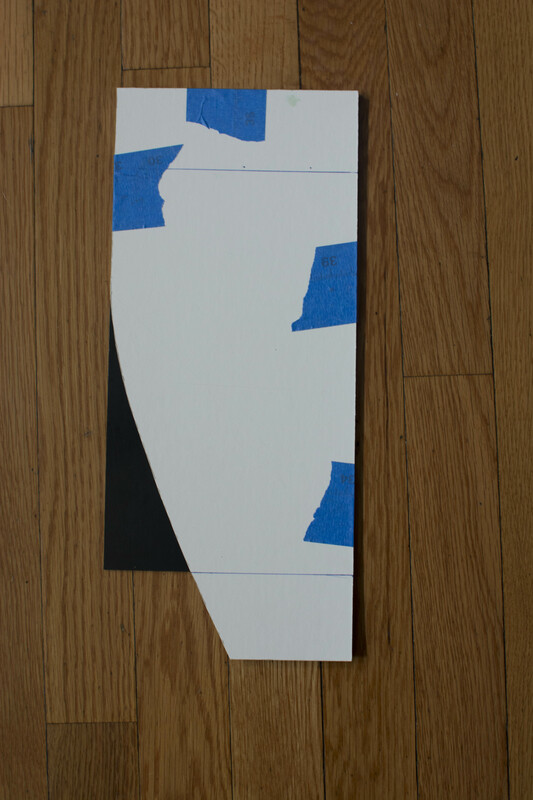 First, cut the ABS sheet down the middle lengthwise to form two 6″ x 24″ sections. If you have a hacksaw, you may be able to do this is one cut. I only had a utility blade. While this eats up less material in the cutting (i.e. the width of the blade equals the amount of material lost), it takes longer because you need to “score” the material. If you’re not familiar with scoring, that’s where you don’t cut the material in one operation but, instead do a progression of cuts, each deeper than the next, to eventually cut all the way through. One trick I found was that I only need to score about halfway through before I could fold the sheet and get a fairly clean cut. Another tip to get a nice clean score; once I had my straightedge laid out and measured correctly, I used blue painter’s tape to “lock it down” on the non-cutting side. This keeps the straightedge from moving between scores (cuts). Resist the urge to try adding too much pressure on each cut. This first one is the longest and I honestly had to walk away from it because my hand went numb after a while. Taking a 30 minute break, some aspirin, and some beer helped me. I highly recommend it. Now, you have two sections of 6″ x 24″. Take one and cut it in half as well. Same process as before. The resulting 6″ X 12″ sections will be the sides of the hood. Now, here’s the only part that varies depending on your specific monitor; the length of the top section. 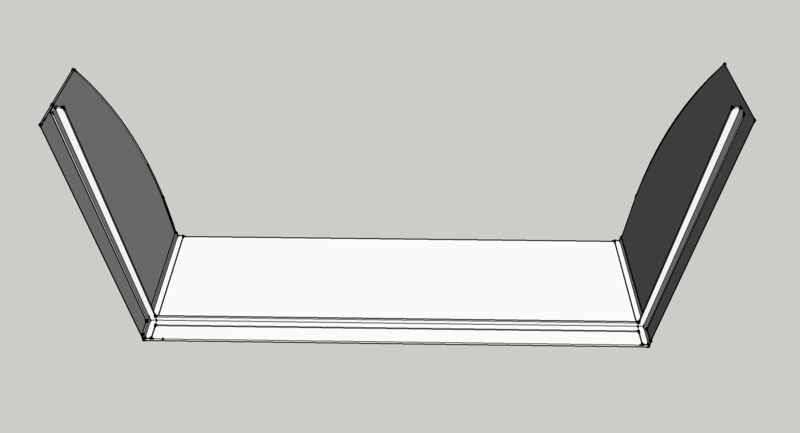 The U2413 has curved corners so just running a tape measure along the top is a inaccurate. The better option is to run the tape measure across the face of the monitor and measure to the outtermost edges. Now here’s the most important part; be very exact and remember to add the width of the ABS angles. Here’s how it worked in my case; edge to edge the U2413 is 21 7/8″ wide (like I said, be exact to 16th’s of an inch). 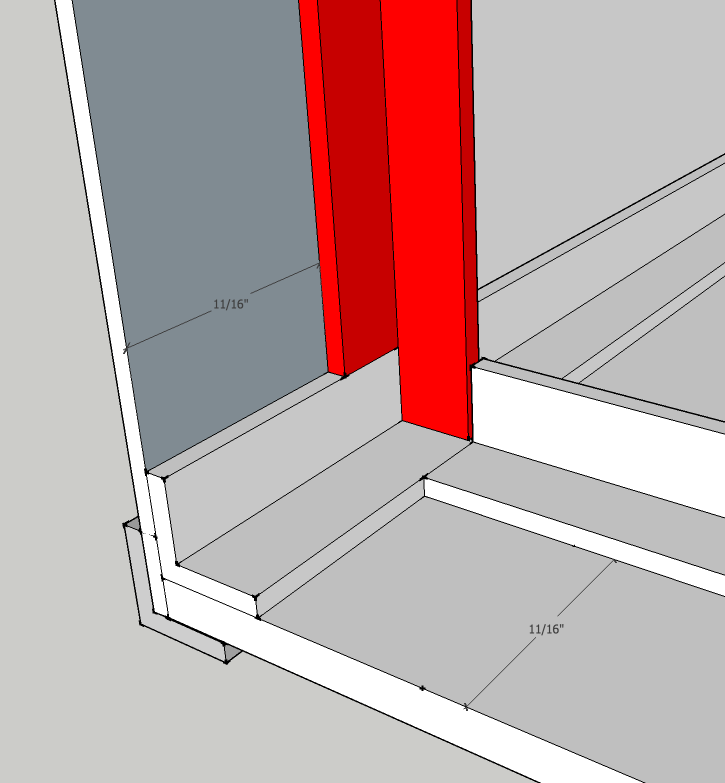 If you bought the same angle as in my bill of materials, the wall width of the angle is 1/16″. We will use two angles; one on each side. If you have a U2413 like me, then just take the 6″ x 24″ section and cut the length to exactly 22 inches. 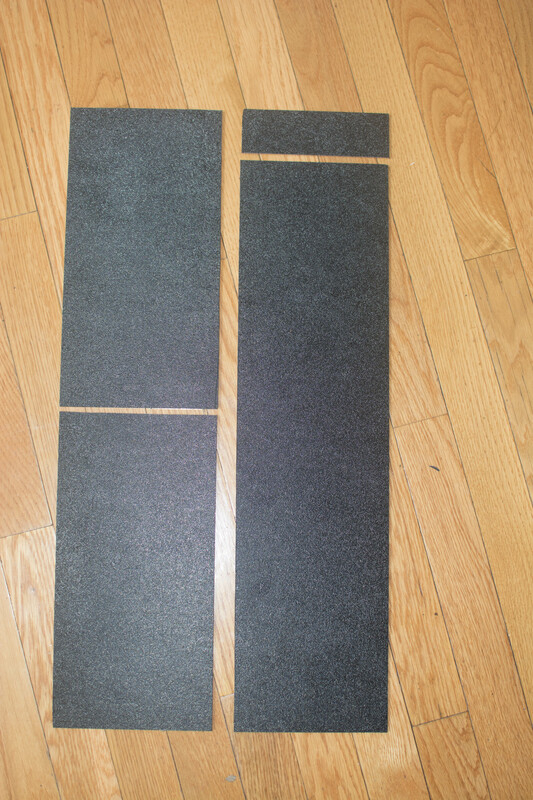 Left: The 6″x 12″ sides – Right: The 22″ top with a bit of scrap left over. NOTE: At a 12″ length my sides are about 2 3/4″ short of the bottom of the monitor. If you’d like longer sides (as I would, were I to do it again) use a 24″ x 24″ ABS sheet. You’ll have to adjust your measurements slightly and make a few more cuts. If you’re tired of cutting, you could just leave the sides squares and go straight to gluing. However, curved edges will make your end result look that much more professional. Here’s where I found Roger’s post the most lacking in detail. He just referenced an Eizo manual and a small diagram of the hood that comes with it. I found that difficult to adjust to the dimensions I needed. So, I created my own using OmniGraffle. You can download my PDF Template. Print the template file on US Legal paper (8.5″ x 14″). Cut it out along the lines and you have your first template. Now, paper isn’t thick enough to use as a straightedge. So, take your paper template and transfer it onto the matboard. I taped the paper to the board on the three straight edges (line it up corner to corner). Use the utility knife to cut along the curve and bottom edge. TIP: Use a pen to write LEFT on one side of the matboard and RIGHT on the other. 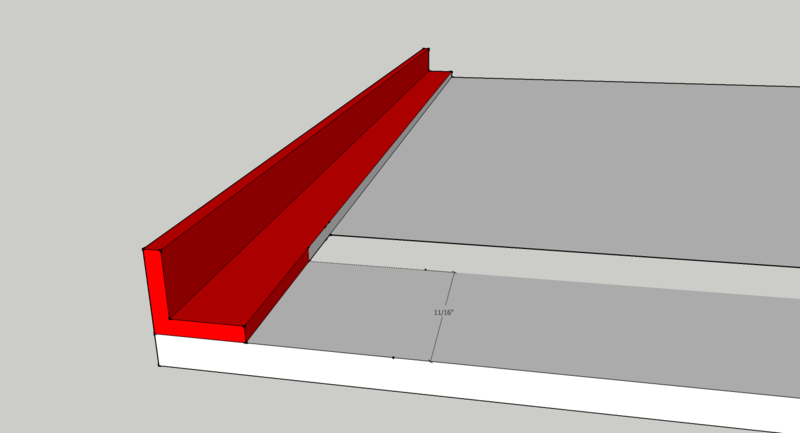 This will remind you to flip the matboard between cuts and keep you from ending up making duplicates of the same side. You don’t have a lot of margin for error with materials here, so measure twice and cut once always. Repeat the same steps (tape included), this time with the matboard to transfer the shape to the two 6″ x 12″ pieces of ABS plastic. Use the same scoring techniques as before; smooth side facing up. Again be sure which side you’re cutting on, otherwise you could end up creating two of the same side. Now you have to cut the L-shaped angle pieces that will serve as the connectors and frame for the top and sides. Again you can use a saw or knife. Same techniques apply. I found it was easy to use my blade to cut through one part of the angle and then just fold it to make a clean break, rather than cut through the entire thing. That will save some time. If you bought the same item I have in my bill of materials, you have four sections 24″ long. You’ll need only three of these with some material left over. Take one section and cut it into 4 equal lengths of 6″ each. These will be the top left and right inner and outer corners. Take a second section, and cut it in half; two lengths of 11 1/2″ each. These will be the left and right vertical edges. Take the third section and cut it to 21 3/8″. This will be your top horizontal section. It will go between the two vertical sections so, we subtract their width from our top measurement (22″ – 1/16″ – 1/16″) . Finally, all the cutting is done. Now comes the assembly. A word of advice, try fitting pieces together before gluing. Once you lay down glue, you’re committed. Sanding the areas to be glued helps gives the glue a better surface to adhere to. You may also need to sand edges just to make sure things marry up correctly. Also, I highly recommend the Plastic Surgery glue. It’s like Krazy Glue only better suited for plastics. I started off using PermaPoxy PlasticWeld and it was terrible for such detailed work. Epoxy expands on drying; creating gaps and leaving residue all over the place. After switching, I was much happier with the results. Take the 22″ x 6″ panel of black ABS that will serve as the top of the hood and place it textured side down. Use the sand paper to scuff up the smooth surface on the left and right face. This will help the glue adhere better. Take two of your 6″ lengths of the gray angles and sand the outer sides as well. Glue the angles flush to the left and right sides of the sheet, angle facing inwards. I used a wood block to make sure the angle was flush to the side. Don’t leave it there too long or it might get glued as well! Glue the angles to the left and right sides of the top facing inward and flush to the edge. Next, take the longest 21 3/8″ gray angle section, sand and glue it parallel to the long edge of the black sheet, 11/16″ from that edge. 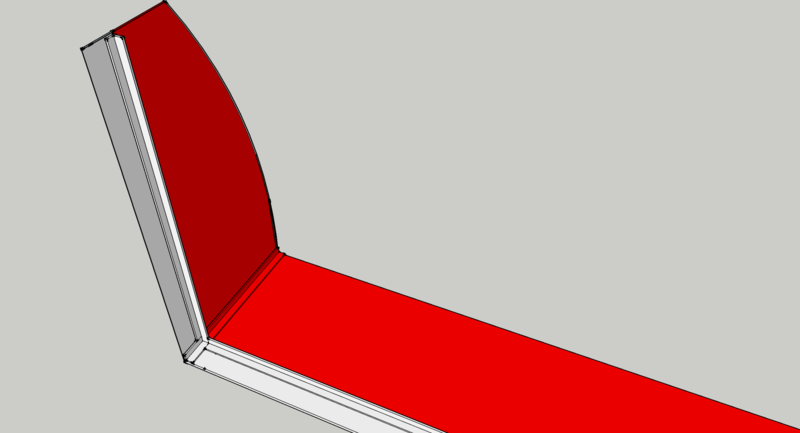 Make sure the inside of the angle is facing the same edge as in the image below. Overview: Place the cross angle between the side angles and perpendicular to the back edge. 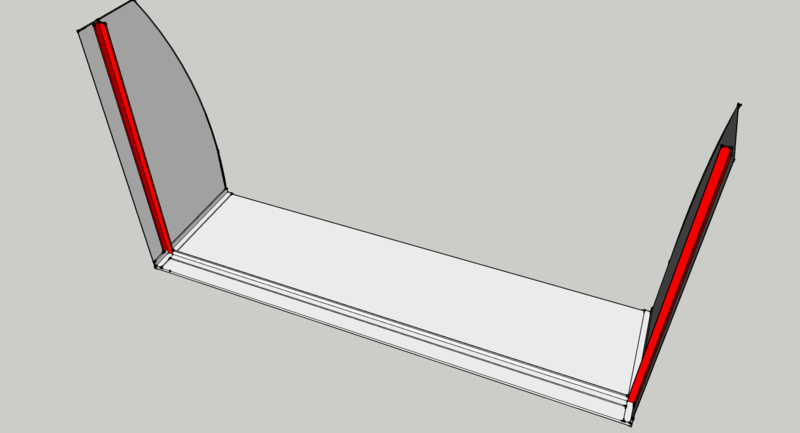 Detail: Place the angle facing the edge and 11/16″ from the edge. Wait about 30 minutes to let the glue dry sufficiently. Now, you can move on to gluing on the sides. Sand the smooth face on the top edge of the side panel and glue it to the side angle on the top section. Repeat on the other side. 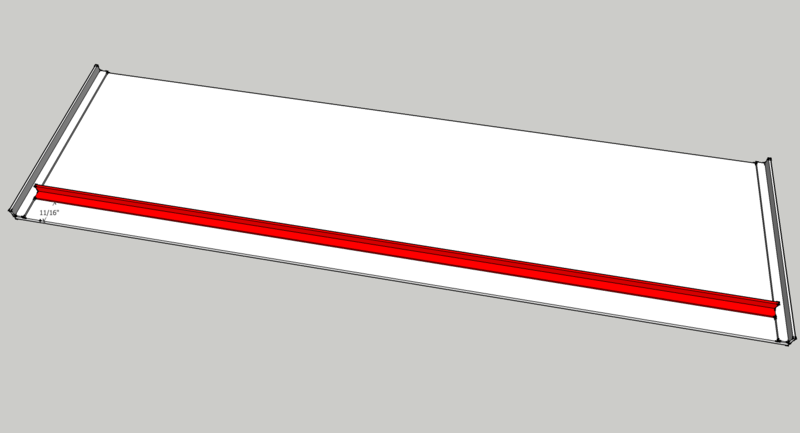 Glue on the sides with the smooth part facing in and the curve facing away from the cross angle. I used a stack of books to hold the side panels vertical while the glue dried. I was concerned about the possibility of dripping glue adhering the whole thing to my desk, so I shifted the whole piece slightly every few second for the first 30 seconds. Give the glue another 30 minutes to dry after that. Take the two remaining 6″ lengths of gray angle and glue them to the outside corners of the top and sides. This will cover up any imperfections in the cuts and make the whole thing more stable. This exterior angle helps add stability and makes the glue-up look nicer. Next part is a bit tricky. Remember you have an extra angle piece if you F* it up. You have two remaining angles 11 1/2″ long. We’ll glue those to the sides, perpendicular to the cross angle. Cut a notch in the top of the angle to make it fit flush and covers any gaps. Again the angle is 11/16″ from the edge. 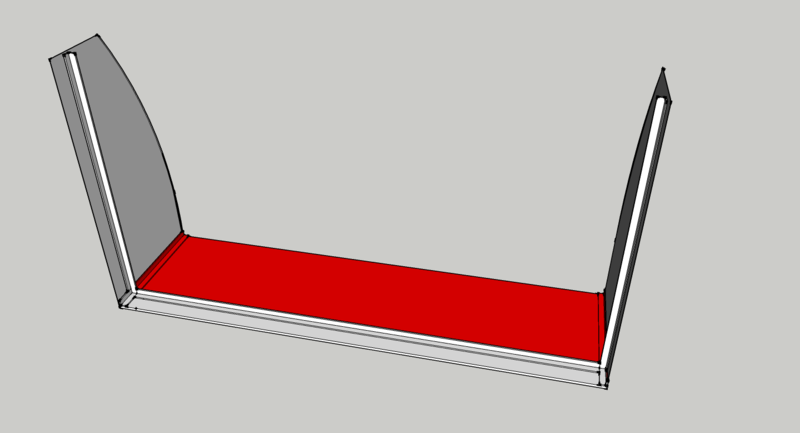 Overview: Placement of vertical side angles. Detail: Notching the end of the angle allows it to sit flush. It’s easier to confuse sides here, so take your time and do one side at a time. Sand and glue the angles with the inside corner facing the back. Overview: Top down view of completed assembly. Sand down any sharp edges or overlapping sections where things aren’t flush. You may have some white on the edges of the black plastic sheet from where you folded it. Sanding it will get it back to black. We’ll also use the paint at the end for touchups. Cut out a section of the microsuede 23″ x 5 7/16″. This is one inch longer than the top piece so, you have overlap with the suede on the side walls. I scored the backing in the middle so i could do one half at a time. Line up the suede flush to the front edge and fold the back edge over the cross angle. Binder clips or clamps can help here. 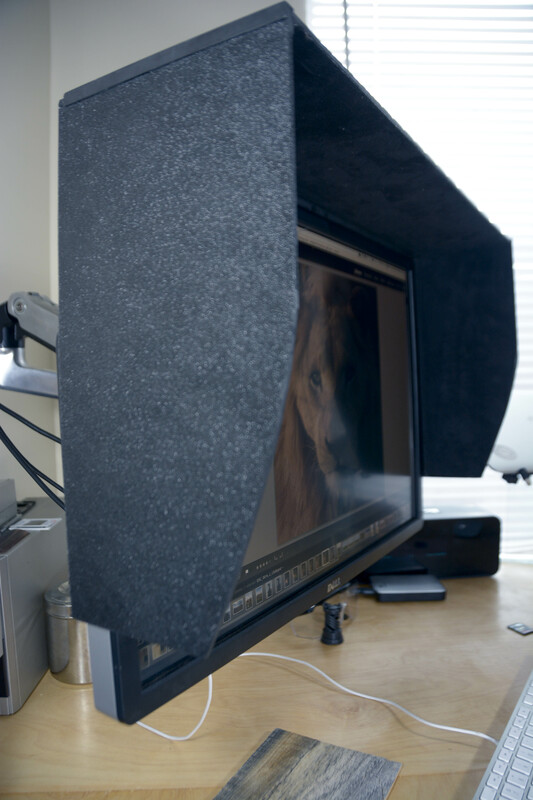 Apply the microsuede to the top front of the monitor hood. It will overlap the sides a bit to cover the interior angle. 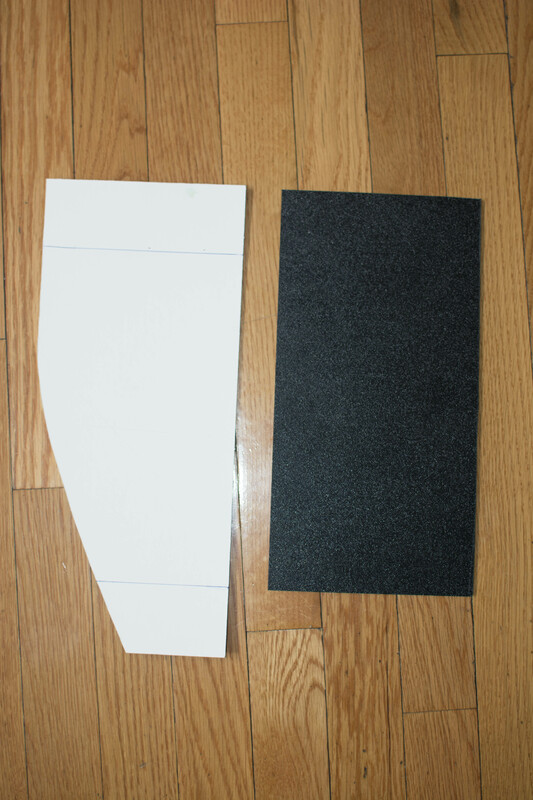 Use the matboard form you used to make the curved sides to cut out two pieces of the microsuede. Make sure to make all your cuts are adhesive side up and make sure to flip the form over from LEFT to RIGHT. Otherwise, you’ll end up getting making duplicates of one side rather than two sides (as I did). The adhesive is quite strong so take your time to line things up. The suede should be flush to the front curved edge (not the back). Remove the backing and starting from the front curved edge, lay down the microsuede. When you get to the L- shaped side angles fold the microsuede over them. You may need the utility knife to make some cuts on the top and bottom. I used binder clips to ensure a solid adhesion on the angles. Trim the material between the back edge and the angle since that’s where we’ll place the velcro strips. Apply the microsuede on the sides. Make sure it is flush to the front (curved) edge. You can cut extra pieces to cover any gaps, but if you did this correctly the only exposed plastic on the interior will be covered by the monitor itself. If the edges have frayed threads coming out, light a match and run the flame quickly down the edge. This will melt the synthetic threads and keep them from unraveling. Paint all outer gray angles and cover any other imperfections with the matte black paint. Lastly, use the Command strips or adhesive Velcro to attach the hood to the monitor. I placed a one velcro strip on each side and two on top. You’ll need to trim the pieces to fit. One day when I get a hacksaw, maybe I’ll cut a section out of the top center so I cant use my display calibration with the hood on. (See step 7 in Roger’s post.) My hand was too cramped after all that cutting to bother. Here’s a few attempts at documenting the final product as beautifully as Roger did. » This is Part 1 of 3 part series. Be sure to check out Part 2 and Part 3. 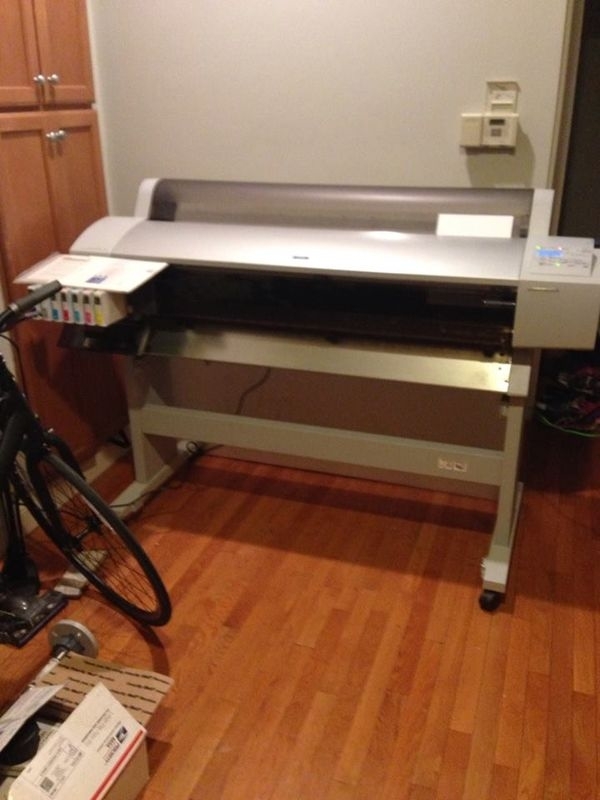 In NYC we keep our large format printers in the kitchen. So, what started as a simple desire to enlarge some of my photos ended up with me on Craigslist and ultimately hauling a six foot wide, 100+ lb printer from South Jersey into my one bedroom NYC apartment. Go big or go home, right? The Epson Stylus Pro 9600 with Ultrachrome ink is a bit of a throwback (mine was manufactured in 2004) but, from what I’ve read, it is still the workhorse of many print shops and photographers. However, the biggest con of buying antiquated (and used) hardware is digging up all the manuals and software necessary to get things running. In my ongoing effort to give back to the internet, I’m documenting my experience and trying to centralize some of the information I’ve found thus far. One of the more interesting things I’ve noticed is that given that this printer was first introduced over a decade ago, some of the web pages devoted to it (like here and here) look like something you’d find on the Wayback Machine; lots of pixelated gifs and centered white text on black backgrounds, if you catch my drift. My Mac OS X 10.8.x didn’t recognize the 9600 when I first plugged in the USB. So, my first stop was the Official Epson 9600 product page. Luckily they have drivers compatible with the latest versions of Mac OS X. Not as much luck with the utilities, ICC profiles, and firmware, however. On the Drivers and Downloads page, there is a link to a set of ICC profiles produced by Bill Atkinson, which are purportedly better than those that come with the standard printer driver. Unfortunately, the files available for Mac’s all have a .SEA.HQX extension which is an ancient compression format (Mac 9 or earlier). You’ll be able to use the standard Archive Utility app to extract the .SEA file from the .HQX archive, but the resulting .SEA file is an executable archive can’t be opened in newer versions of Mac OS (Leopard, Snow Leopard, Lion, Mountain Lion, Maverick). If you don’t understand what all that meant, ignore it, and just know that using some Technomancery©, I was able to extract the profiles and a link to a Mac OS X-compatible file containing all the Bill Atkinson 9600/7600 icc profiles is available below. All you need to do is double click the zip file and copy the .ICC files to Macintosh HD > Library > ColorSync > Profiles. You’ll be prompted for your password to copy files into this directory. 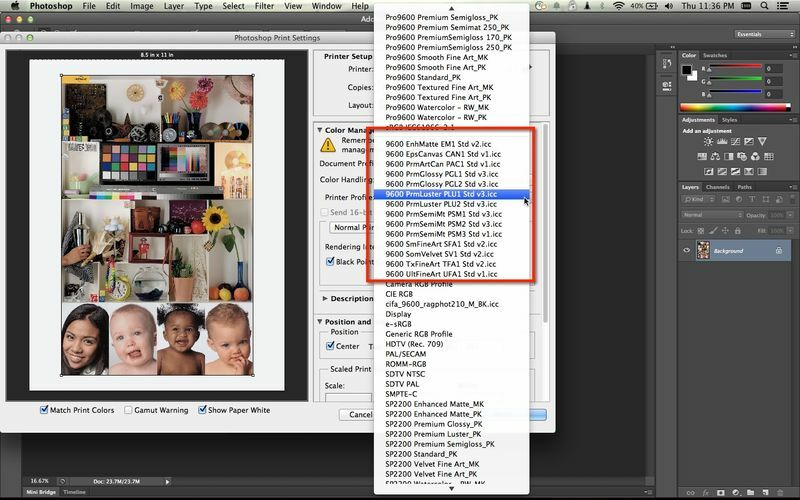 Once you’ve loaded the profiles they will appear in the list of the Printer Profiles when you print from Photoshop. From the previous owner I learned that the printer had been sitting idle for a few months (at least). The first thing I did was to print off a standard test file on a sheet of 8.5’x11″ Epson Premium Photo Glossy paper to see where things stood. First results were promising. No noise from the printer that would imply any worrisome mechanical issues and the print itself was fairly sharp. I was so pleased I even went ahead and shot off a 36″x44″ print using a roll of Epson Premium luster paper. A second test with Epson Enhanced Matte Paper showed some fairly significant horizontal banding. A post to the Epson Wide Format Yahoo Group told me that this could be resolved by running through the Head Alignment utility on the control panel (details in the Epson Stylus Pro 7600/9600 Printer Guide, page 57). After a few runs, I was able to get rid of the banding. Thanks, jrstewart8. Now you think I’d leave well enough alone, but dealing with the head alignment issue got me thinking about getting ahead any other potential maintenance issues. One of the most common issues cited on the forums was the printer head clogging. First stop, Nozzle Check. Result, not so good. There were very noticeable gaps in the Magenta and Yellow sections. From a few of the resources below, I understood that I needed to get some windex and clean the printer head, capping station, flushing box, and wiper blade. This page from Northlight Images has a nice set of instructions on how to do this. This video shows how to get the head free and use a saturated paper towel to clean it. This video gives you a slight out-of-focus view into cleaning the wiper and capping station, albeit on a Epson 4600 (I think). The previous videos in conjunction with the repair manual from American Inkjet Systems should help illustrate the process for you (see Figs 2-15 & 2-15 on pgs. 12-13). When I opened up the front cover, moved the head, and first inspected the station, I was not completely surprised to see tons (probably years worth) of dust and dried ink all over. I saturated a strip of paper towel with Windex and put it behind the head and let that sit while I worked on the rest. Now the AIS manual shows how to take of the whole side to get at the cleaning station, but I thought that would be tempting the Gods. (The Gods and I have have some history when it comes to electronics repair.) So, I left the screwdriver in the toolbox and worked on what I could access from the small opening. I had a syringe that I used to set up the continuous ink system on my Epson 2200 which gave me the reach I needed to saturate the capping station and flushing box. The wiper was a bit more difficult. I was able to reach it with some q-tips but wasn’t able to clean it as thoroughly as I would have liked. I ran through the steps three times with a standard clean (press the control panel button for 3 seconds) and nozzle check after each. (Hint; use plain cheap printer paper for the nozzle checks) It got worse before it got better. At the end however, I still had one tiny gap in the Magenta that would not go away. I ran a power clean but that didn’t help and only succeeded in killing my Photo Black cartridge. Luckily, I had an extra. That’s the worse thing about using the clean cycles; they consume ink across the board -not just for the nozzle you’re trying to clear — and a lot if it. That gave me an idea (sure enough some others have come to the same conclusion before me) to just print a page of only that color to simulate a clean. An additional suggestion was to use as high a resolution as possible to do this, so I sacrificed a sheet of photo glossy to the cause and printed out a single sheet of magenta. Well, it was a nice idea in theory but in the end I still had that small gap. I probably could waste more ink, paper, and time on this but, perfection is the enemy of done. So, I decided to let it go and move on. Given some of the severe head clogging posts I’ve read, I’m in good shape and probably approaching the point to diminishing returns. If I ever want to revisit this, it looks like the next option is to purchase cartridges filled with cleaning solution and run that (AbsoluteInkjet, Inksupply , and Amazon have them). Unfortunately, that’s a expensive investment and people seem to have mixed experiences with it. I believe the 9600 isn’t officially supported by Epson anymore. If it is, I have to imagine it’s soon approaching end-of-life status. So, if they’re going to stop making parts for it, I wanted to see where things stood with the consumables and hardware. I’ll probably want to stock up on some items now rather than when they become scarce and presumably more expensive. The Printer Status page (see page 131 in the EPSON 7600/9600 Quick Reference Guide) told me that the two motors and head were in great condition (5 stars). Great news given how expensive and difficult to replace those parts are. The automatic paper cutter blade was good (4 stars) but the Cleaner (2 stars) and Maintenance Tank (1 star) less so. From what I’ve read the paper cutter blade (part # C12C815291) can’t be sharpened, so the only option is to lay down ~$100 for a replacement. Might be worth stocking up on one of these. Though, since this same part is used in the newer 9800, I’m not as worried about future availability. Also, I’ve been know to wield an X-Acto with some degree of skill. An extra Maintenance Tank came with the printer when I bought it. Even then, this is where are the extra ink is dumped during ink cartridge changes and cleans, which happen frequently. It’s just a plastic tank with some absorbant material to catch the excess ink that somehow costs ~$25-$30. I read more than one forum that suggested reseting the maintenance tank chip and just replacing the absorbant material with .. *ahem* … tampons. For those men wanting to save themselves the awkwardness of buying feminine pads at CVS, you can use the chip resetter that came with the InkOwl Refillable Cartridges I ended up buying. When it gets full, I dump out the contents, pack it with 2 boxes of 2×2 Cotton Squares, and reset the chip. I had no idea what “Cleaner” meant. Maybe it referred to the cleaner head (a.k.a wiper, part # 1113691) or the flushing box (part # 1112239) or cap assembly (part # 1091110), all of which I had tried to clean earlier. Wipers were hard to find. AIS and Ebay had them for $6 – $20. The other items are even harder to find. The few that google showed where in Europe and more than I spent on the printer itself. This might require more research. I’ll follow up with another post when I’ve decided a course of action of these last items. Until then, here are some resources I found very helpful. I've maintained this blog for a few years now, posting Salesforce related items on and off (admittedly more off than on). Recently, however, I was asked to kick it up a notch and become an offical blogger at Salesforce.com's DeveloperForce for both the Blog and Wiki. I know, right? My first effort was to co-author the article Apex Design Patterns along with two other top experts at Salesforce.com; Dennis Thong and Manu Erwin. To give credit where credit is due, the article is based on a presentation Dennis delivered back at Dreamforce 2012. So, my contribution was a bit more Ctrl-C/Crtl-V than coming up with original content. Though, now that I've been given the keys to the kingdom I'm feeling a bit more motivated to take on some off my personal blog posts that have been languishing in draft mode. Stay tuned. My latest project at work is finding a new office space. For anyone familiar with New York real estate, you’ll understand how much effort’s involved. Surprisingly, I don’t mind it as much as I thought it would. In fact I’ve come to enjoy seeing these raw spaces, seeing past their current condition, and imagining what they could be. I’ve found myself perusing design websites and reading Architectural Record on my off-time. The worst was when I was at a recent exhibit of Serra at the Moma. I thought … this could make a really cool conference room. Before I took the plunge and forked over a few hundred $ and bought me treo 650, I used to think the ‘from my treo/blackberry’ signature on email was a conceit. Now after a few months I realize it’s really a request for forgivesness in advance for typos, crypto abbr.’s, and gennerally curt msgs. I am certain that a certain point spelling will be a rare talent. As a technologist, so much of what I do requires that I know something about everything in my field. Given the pace with which new innovations and technololgies are introduced, it’s impossible to be an expert in all things technical. The best one can hope for is a generalists’ understanding and access to Google. I rely on the latter so much, in fact, that it prompted the start of this site. Digital Karma. To give back to the online spring of knowledge from which I drink so often.